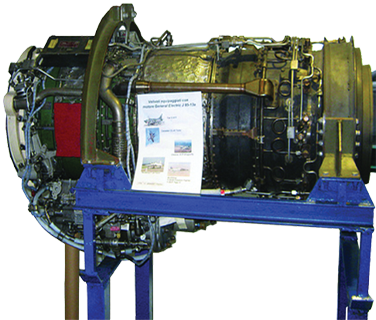 The Model AE-05-J85 is a teardown J85 Turbojet engine, mounted on a stand. The teardown engine is used for hands-on training for the disassembly and re-assembly of engine parts and sections. The students can also perform engine inspection. In conjunction with our Model AE-06-J85 engine cutaway, students can gain a thorough familiarization with engine construction and assembly. The engine stand allows easy positioning of the engine during work. The stand includes casters that allow convenience in moving the engine as desired. Dry weight: 410 Lbs. approx. A computer based training package (CBT) is available as an optional item (at additional cost) which provides a simplified explanation of the gas turbine engine, and also specific details of J85 engine with rich graphics and animations. The CBT may be used by students for self paced learning, and it may also be used by instructors to present high quality graphics and animations during the classroom lecture.